I’m guessing Benjamin Lewis didn’t taste this wine. But do a search for quotes about Pinot Noir and you’ll see many experts expressing contrary opinions. I was brought up at a time when most “good” wine available in the U.S, was from France and so I too was a Francophile. Trips to Oregon and later California adjusted my outlook. And now, I’m more involved with what is inside the bottle and less about where it was shipped from. Rather than change allegiance, I prefer to think I’ve broadened my outlook. Let’s be honest. There is a lot of bad Pinot Noir out there and people have made many millions of dollars producing it and then selling the brand. But comparing a $20 bottle of that stuff to a quality offering of Pinot Noir is like equating a “Puddin’ Pop” to nanna’s home-made tiramisu. It’s just not a fair comparison. Pinot Noir, thin skinned as it is, suffers from a bad attitude both in the vineyard and in the winery. Vines require constant attention and are susceptible to rot, mildew and viruses. Clonal selections can increase yield (a shortcut). Barrels are expensive. And how long they are used is a cost factor. It can be expensive to grow Pinot Noir and it can be expensive to produce and shortcuts don’t make for a good finished product. And all along the way, Pinot Noir is just stubbornly capricious. But when it’s good, it is very good. Sensual and suggestive, charming, transparent yet mysterious. I’m reminded of my own saying that “Every palate is personal and correct for the person owning it.” If you like Puddin’ Pops, that’s fine. But it’s only fair that you acknowledge it cost more to make the tiramisu than the pop. It’s also fair for people like me to acknowledge that the world standard of Pinot Noir remains in the Cote de Nuit where Domaine de la Romanee-Conti is produced and, depending on the vintage, comes with a price of $7,000- $12,000 (and more) per bottle. You can also get, for just $234, a bottle of Domaine des Lambrays Clos des Lambrays. And for only $26.95, a bottle of 2015 Louis Latour Cote de Nuit-Villages. The point being terroir does make a difference - yes. But so does demand. And so does, for some, image. And so does one’s ability to afford the higher end stuff. But can we at least slough off the quick dismissal of any Pinot Noir not from the Cote de Nuit and pay attention to what’s inside the bottle rather than only where it was shipped from? 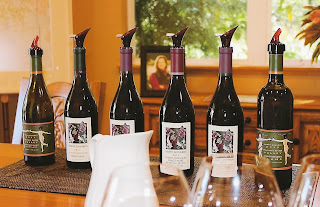 In California, in the cooler growing area of the Russian River Valley, is where Merry Edward grows and produces the Klopp Ranch (single vineyard) Pinot Noir. But, like Grandma Moses, Merry didn’t start young at her particular genius, nor did she have the advantage of growing up in the family business. While a physiology major at Berkeley, she bought fruit at the farmers market and played at making wine. 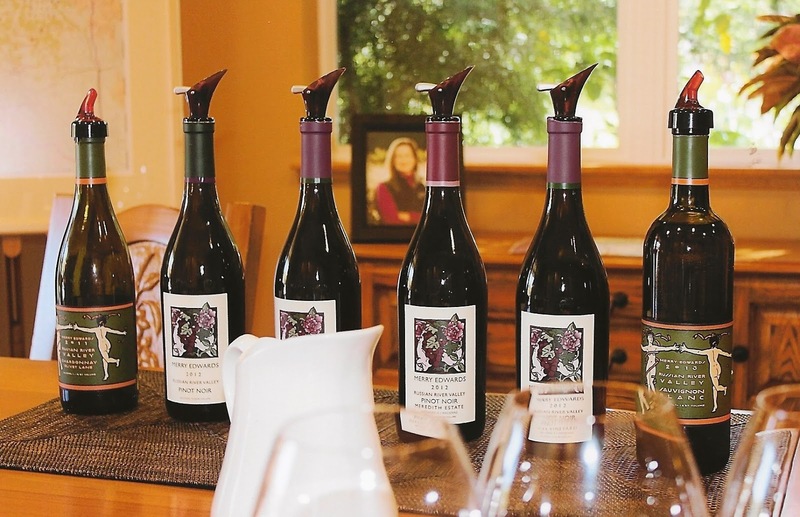 It proved popular After college, she attended the enology graduate program at UC – Davis. Later, she ran a 25-acre vineyard and did everything she could to learn the business. At age 50, she was forming a company to produce wines in Sonoma, met a fellow rafter (she was rafting in the Grand Canyon) whom she later married. He had a degree in agriculture and for ten years they made wine in a rented facility. Eventually, they built their own winery. 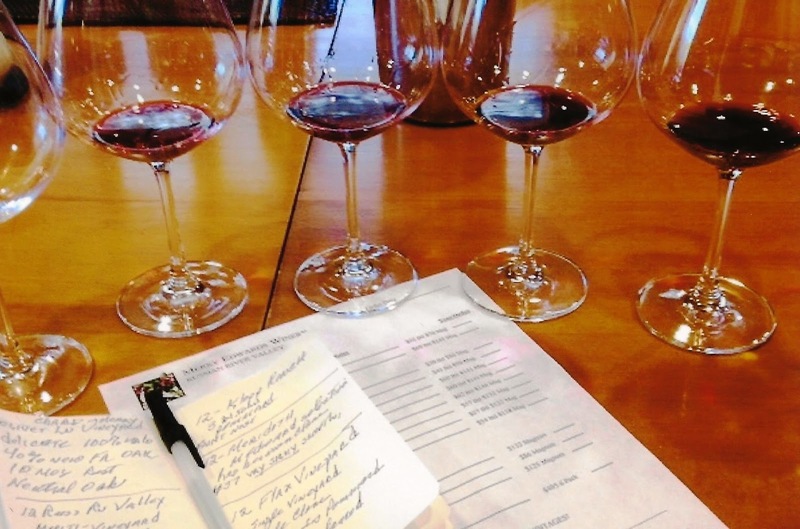 I visited the winery in October of 2014 and was grateful for the extreme courtesy of a private tasting away from the busy tasting room, allowing me time to better appreciate (during their very busy season) what it was I was tasting. The wines were amazing. And when I recently opened this bottle of “Klopp Ranch” 2012 it brought me back to that glorious tasting. But the wine spoke on its own. To aromas of dried candied fruit, but with a savory note. Burnt cherry, but brandied fruit. Forrest floor (old world and with some mushroom), white pepper. Floral notes of rose petal and lavender/violet. Tastes of cherry, sure – it’s Pinot Noir, but different, mysterious. Plum, white pepper, dried fruit, cardamom. Some tannin but spread evenly across the entire palate and ever so gently, lifted by the wine’s clean acidity yet seamlessly. Everything about this Pinot Noir is different. Layers of cherry but with earth. Bright but earthy. Whispered hints of strawberry lighten the truffle hint. Anise? Floral notes of violet meld with light wood. There’s a mix of minerality against brambled berries opposed themselves by black tea. This is indeed complex, intriguing, mysterious and a wine you want to keep tasting just to understand; a Flying Wallenda of balance. Methode a l’Ancienne is used on this bottle’s label. It means a “minimalist approach to winemaking”. Interestingly, that approach is exactly that used by the “winemakers” – they don’t like the term “winemakers” in the Cote de Nuit. Instead, it’s all about terroir. Indeed, there are other California Pinot Noirs I enjoy (3 others?) and include another from the Russian River Valley. But something about this wine by Merry Edwards makes it stand out even from others she produces, despite that I enjoyed them all. So while terroir may always remain the genesis of disputes (after all, “Klopp Ranch” is a single vineyard), and while Merry Edward herself refers to a “minimalist approach,” my palate tells me she isn’t taking enough credit. For this Francophile, it will remain one of my favorite “Burgundies” and very well-priced by comparison. Fermentation: Partial whole cluster pressing. (My opinion: Lifts fruit and freshness). Others note “adds spiciness”. Aging: 10 months French Oak, 63% new.